So I take the lack of answers to my last post as a No. I am however contemplating wearing it tomorrow when we go to my SIL's for a 4th birthday party ... Still undecided. I feel like I haven't been sewing much of anything lately - maybe that's because I've not sewn for the girls but rather done pleasure sewing for myself. I've done up four beautiful Dresden plates and have had no idea what to use them for - but the other day I found a tutorial on turning them into plate chargers/place mats. Definitely doing that. I have made three star pillows - none of which have been photographed properly and one of which (the pink one below) will be given away tomorrow as a birthday present for the 4 year old cousin. 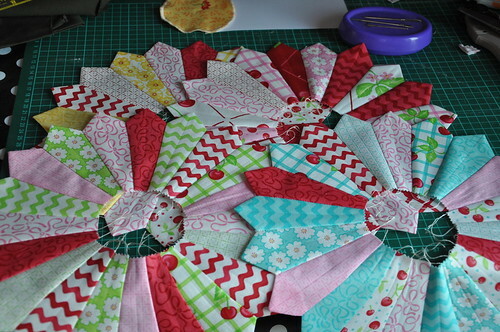 I have started a new quilt using a lovely jelly roll by Figtree Quilts called California Girl. It's shaping up nicely. I still have lots of it to do but it will make a nice lap quilt soon enough. 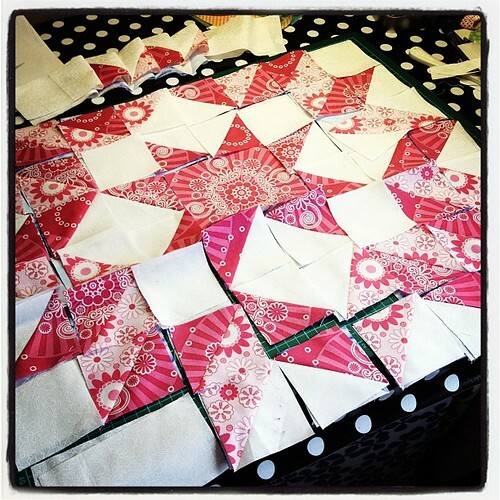 I also started basting my huge Oh Cherry Oh-quilt but ended up unbasting it when I realised the border was much too wavy and I will have to fix that first. It's so huge so clearing space to baste it is such a hassle. It was quite a disappointment when I had to take it all out again. This week I've been home sick and home because Sofia's daycare was closed. 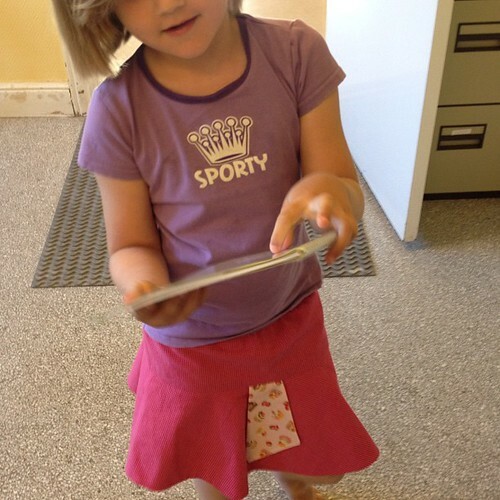 I sewed up this skirt for her in one evening. I love it on her as it has a lovely kicky feeling to it with the flounce and that tab being folded to the outside. She loves it and that makes me happy and contemplating whipping up a couple more for her but I don't think she needs more skirts. I'm having plans for a pink twill pair of cargo pants for her. I just need to tape the pattern together. Also making all those half-square triangles for the star pillows made me want to revisit the quilt I made for Isabel when she was born. I bought a lovely pile of blue Kona Cotton fat quarters that I expect any day now - I may have to think about doing an updated, and up scaled version of that quilt for Isabel. Maybe for Christmas.